Complete plans to build your very own DIY DTG printer based on Epson A3 models. 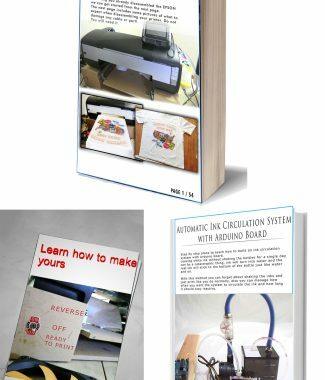 This plan has a step by step guide and illustrated images to help you convert and build your T-shirt printer at home! Once you have downloaded our eBook you’re eligible for online support. If you need any help or need assistance just message us via the contact form or directly on our facebook page and we will help you from the beginning to the end. UPDATES: Now even better with additional 8 new pages added and extra pictures & images! The most affordable DIY DTG Plans on the internet! 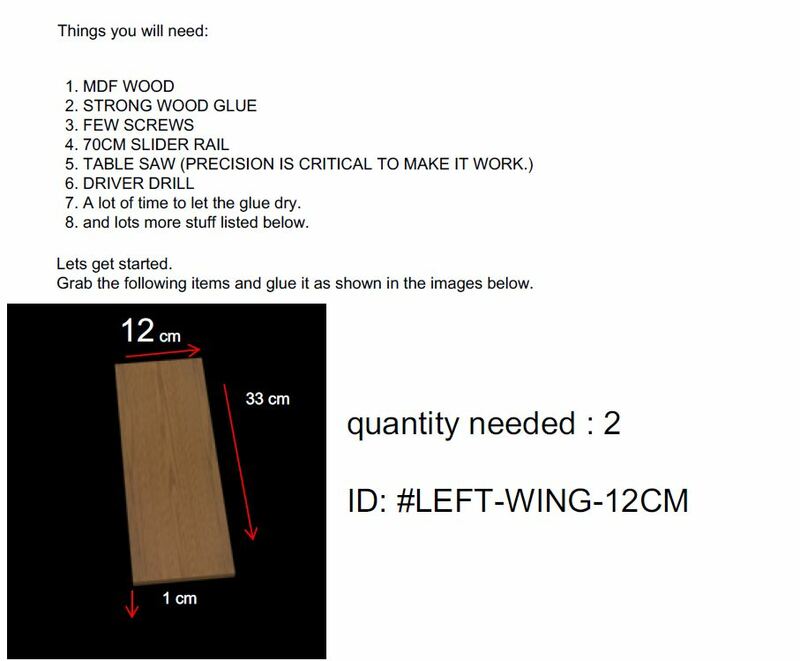 Build your own DIY DTG printer using only the internal parts and some woods! This guide is aimed at creating a very affordable printer using only the internal parts and some woods only. No Arduino, no coding or programming required! Just build the base and set all the sensors in the correct place to make it work. Once completed, you can upgrade it as you wish with Acrylic parts or metal parts. 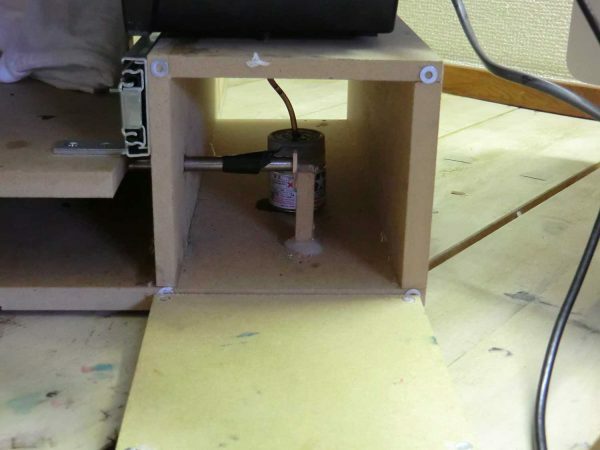 With this guide, you will have access to sensor positions, base dimensions and you will learn how to set up all the sensors in the correct location so you can print onto a T-shirt or Wood parts. Includes 1 minute video showing what it should look like. It’s never been so easy to build your own DTG! With this newer version, you will spend less time building and more time getting your business ready! Stop looking on the Internet for DTG guides, this is the most accurate and the most complete plans you will ever find. This eBook includes online support, so you don’t have to worry if you get stuck or need assistance with the building process. Step by step guide with images and text and 1 short video located on e-book page 33. The same eBook works for all printers listed above. They all look different from outside but the interior parts are all the same to each other. The only difference is Wi-Fi/CD Printing/ 6 or 8 ink cartridges, but the conversion process is the same for all models. 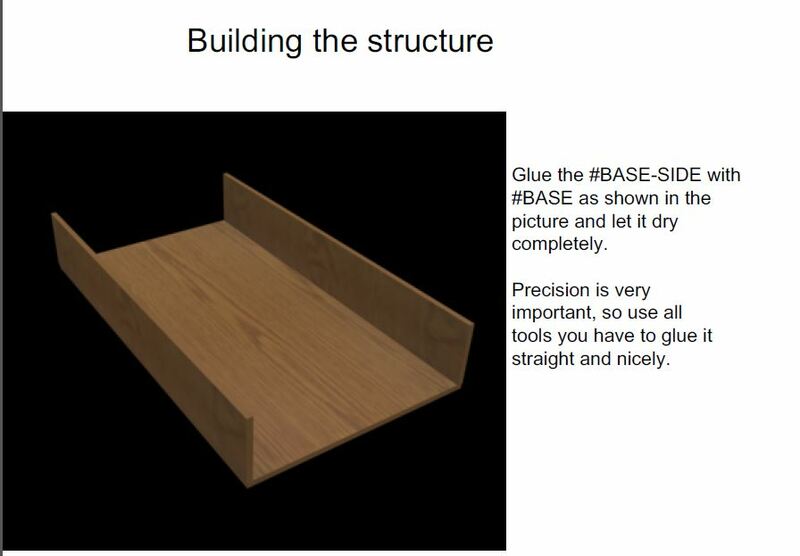 This eBook has step by step guide with illustrated images & high-resolution images to help you build the base and attach all sensors and motors in the correct position. 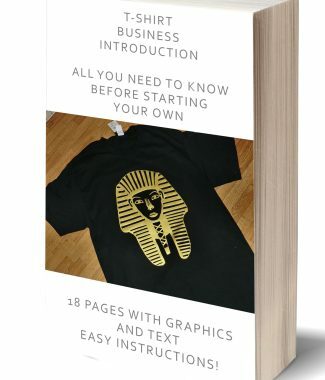 This eBook covers tricks & secrets that other guides don’t and you also get online support. This guide includes all sensor positions and how to bypass them. Can it print on dark t-shirts? A: Yes, you just need an A3 printer with 6 cartridges and a RIP Software like EKprint or Acrorip! Contact us for the updated link. Is this friction or belt system? A: Friction. This project is aimed at creating the cheapest DTG using minimal parts so we will only use the parts of the printer and some woods. You’re free to upgrade as you wish once complete. Hi, I’m struggling to find any printers on your list in the UK. I found an Epson expression photo HD xp-15000 for a decent price, will this be compatible? Thanks. Sorry, but Epson XP-15000 is not compatible with our eBook. Have you tried looking for refurbished models? How about EPSON SC-P807 (A2)?any solution? Sorry, but SC-P807 is an A2 model and is not compatible with our eBook. A2+ printers have a huge t-shirt table and the small motor wouldn’t be able to handle all the weight. Can you recommend the most inexpensive printer to use on white t-shirts, and your recommendation for 6 or 8 inks? Some of the printers listed in the description is hard to find or no longer for sale. Can you tell me which models listed above you are able to purchase? 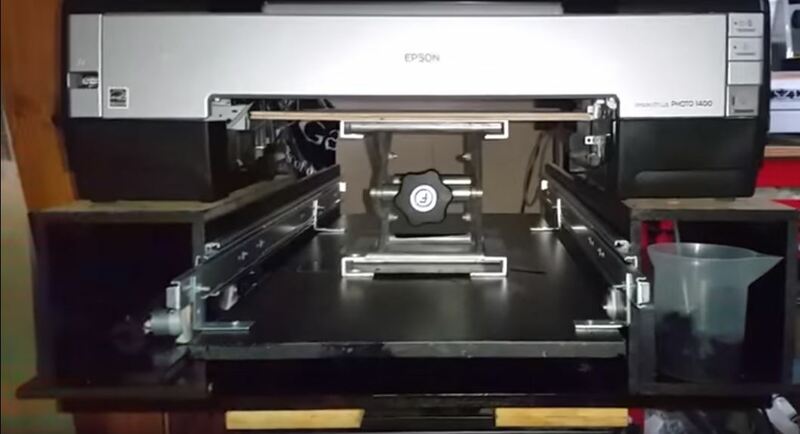 Hello I have a epson 1430 used can I convert it to dtg diy will the ebook help me step by step with materials and steps to build it? Yes, Epson 1430 is fully compatible with the eBook and you can even print white ink using a RIP Software. The eBook has everything you need amd you also get online support through the whole process. Please let me know if there’s anything else that I can help you with. Sorry, but unfortunately we do not have manuals for A4 models. If you want a DTG for printing on t-shirts I highly recommend an A3 model. A3 printers are much more reliable and will provide you with a much higher quality printing capability than A4 models. hi I am very interested by your ebook. but I have 1 question.. is it compatible with Epson me101 printers? Unfortunately, Epson ME-101 is an A4 model and it’s not compatible with our eBook. Any printer listed in the eBook description is fully compatible and can be converted into a DTG printer without any problems. Hello Question, aside from the hardware required for assembly, will this require purchasing any mechanical supplies such as motor for the platen tray and or a main/mother board for controlling the platen? You do not have to buy a motor or Arduino board to complete this project. 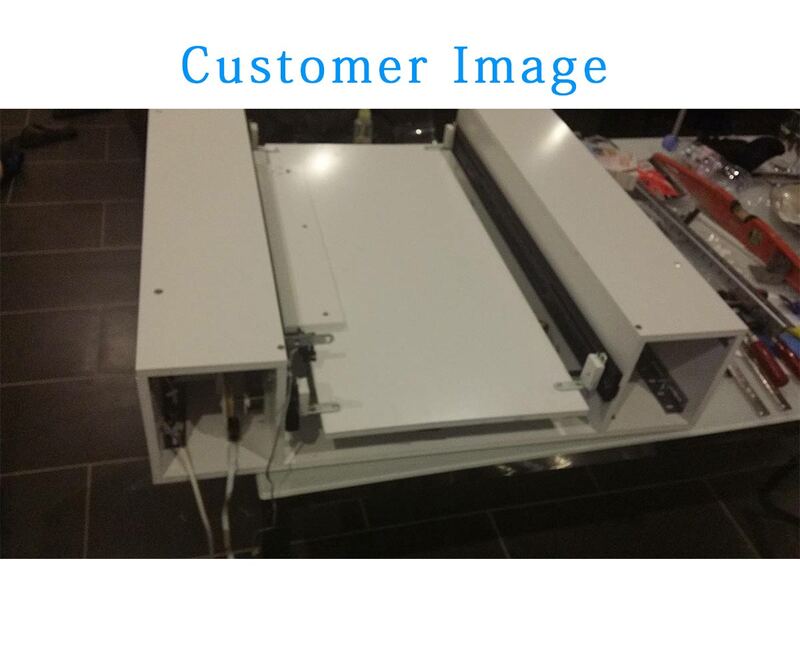 The printer has an internal DC Motor and that’s the motor you will be using to move the platen back and forth. You only need the RIP Software if you want to print white ink. Please send me a message via “Contact us” so that I can send you the link to purchase the recommended RIP Software. Thanks for contacting Alienbunker today! Sorry, but unfortunately we only sell the plans. Building your own DTG printer is fun and you will learn how everything works. 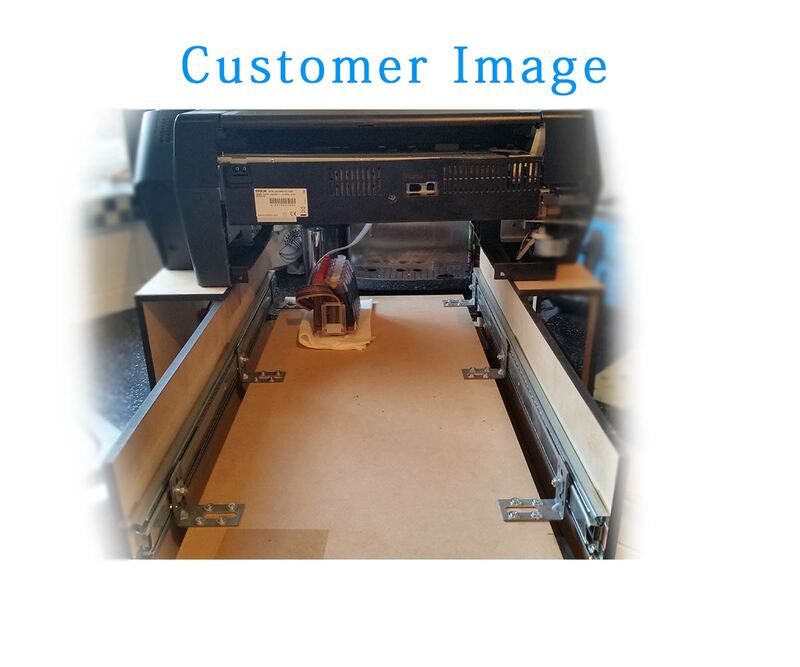 Once you build you first DTG printer, you will be able to convert almost any printer easily. Hi, I have an Epson Stylus 2000p that I was hoping to use for this, it’s not in the list of compatible printers, but is it compatible with the guide? Thanks! Unfortunately, Epson 2000P is an outdated printer, and it’s not compatible with the current plans. Epson 2000P is an A3 model, but it’s from the year 2000, and probably the internal parts are very different from current models. Are you able to find other models listed in the description? The EPSON R2400 is fully compatible with the eBook, and since this printer has 8 ink channels you can print white ink and colored ink very fast. The print quality and resolution is pretty good for this model. Planning to buy your guide, Before that i have aquick question, Does this guide support L1800 model?Can i get all the parts in local market/online in India. I’m not really sure how the local stores is in India, but it’s mostly basic parts that you will need. 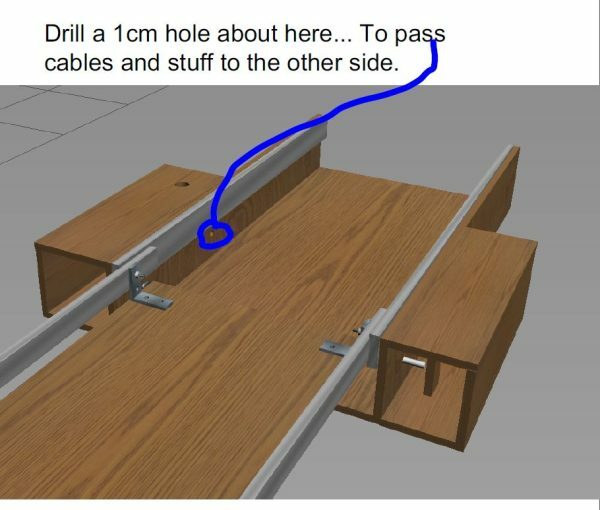 If you can find the 28” (70cm) drawer slide, MDF wood and a few bolts and screws, you should be fine. The guide is fully compatible with L1800. Once you purchase the guide you will be eligible for online support. If you need any assistance just let me know and I will assist you. Your manual looks awesome. Would I be able to us an Epson Stylus R280? This eBook is for A3 printers listed in the description of this page only. The conversion process is similar but the base dimensions is different and there many parts that A4 models doesn’t have. You have to print in 2 phases, first the white layer, and then the colored layer on top of it. There should be no misalignment issues because the paper feed sensor will detect the t-shirt table and start printing on the same position as before. You cannot print both white and colored layer in just one pass. First white layer and then colored layer. Sorry but no. UFO printer uses micro controller to move the table and probably uses some other boards to bypass some sensors. This DTG plans is meant to be very simple using only the internal parts and nothing more. Would it be compatible with the Epson xp-900? Unfortunately, Epson XP-900 is not compatible with the eBook. I believe XP-900 is not a very good model for DTG, because there’s no information about this printer or any software for this model. Feel free to message me if you have any other question. deteriorate after converting the automatic cleaning system ? Epson L1800 can achieve great printing quality! 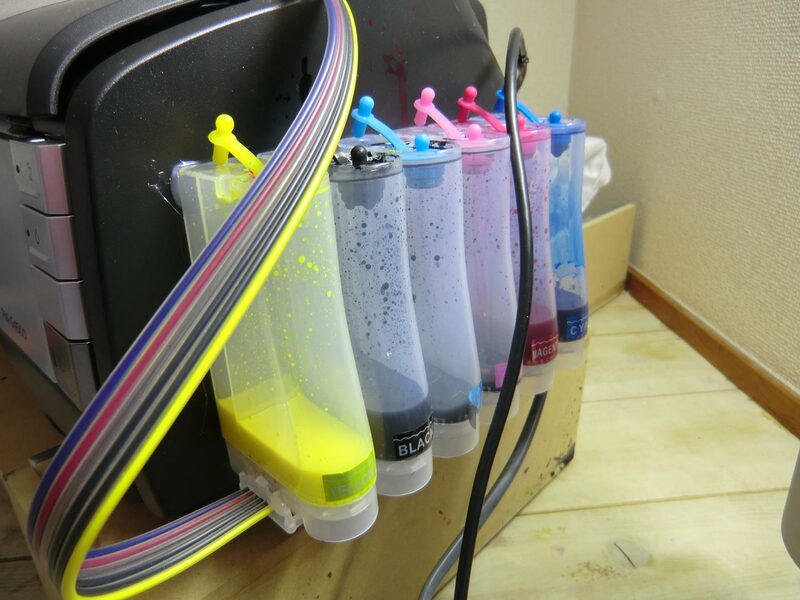 It has 6 ink channels and that means it can also print white ink using a RIP Software. I’m not sure which automatic system you are referring to, but it doesn’t deteriorate or lose printing quality if you use the white circulation system or the automatic reverse system. It can be other thickness as long it’s not too thick or too thin. 1.27cm (1/2″) is a very popular thickness. Be sure to use the same thickness for all parts. Hi, I am really interested to buy your manual. In Spain, the most seller A3 printers was Epson Stylus B1100. Could you tell me if this printer is compatible with the manual? Actually, I´ve already bought one of this printer to test but would be nice to have your book. Thanks and sorry for the question. I looked at Epson B1100 and yes it’s compatible but, it only has 5 cartridges which means it won’t be able to print white ink, you can only use this printer for white t-shirts only. Hello, I want to know what is the best printer for best quality t-shirt print? what is the best ink we have to use for printing? The quality output of the printers listed in the eBook page has all the same printing quality. The only difference is that some has 8 ink channels and some has 6 and Wi-Fi capability, any printer that you choose from that list will have no impact in quality. The ink is very important, if you do not use a well known brand like DuPont Artistri or Firebird DTG ink you might not get a vibrant and good quality. I recommend both brands DuPont Artistri and Firebird DTG ink. The cost for both brands is about $30 per 120ML (4oz). Would I be able to follow the guide with the Epson R2880 model? After I did some research on R2880 I was able to look at the parts and this model is also compatible with the eBook. That means you will be able to convert it into a DTG. Regarding your previous question, it’s highly recommended that you use a heat press to cure the t-shirt after printing. Please let me know if theres anything else I can help you with. I have a an epson 1400 and i was also wondering if the manual show you what type of inks to use and how to maintain it from getting clog or messing up your printhead. 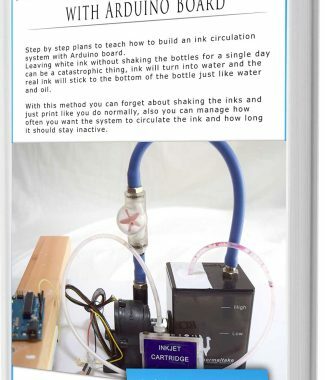 Yes, the eBook shows what kind of ink should be used and how to reduce the chance of getting it clogged. Hello i was just wondering if the manuel shows you how to use it with white ink for blacks? or any color which isn’t a white shirt where you would need to use white ink. There’s no secret in printing white ink on black t-shirts, all you need is a RIP software like Acrorip to be able to replace light cyan and light magenta with white ink, and then configure it in the software to use only those 2 colors when printing white ink. If this is meant for t-shirts, I’m wondering: What is the maximum thickness/height of the material to be printed? There’s actually no limit in thickness as long you modify the base height so you can fit thicker materials. If these plans are followed, can the DTG be used with solvent inks to print on various substrates such as 1/4″ plywood? Yes, it can be used with solvent inks without any problems. Was wondering if this uses DTG ink? Yes, this uses DTG Ink! Only DTG Ink will work, any other type of ink such as Pigment or dye will simply wash away in the first wash so you need DTG ink for this purpose. Hi would this be compatible with the SC-P600 as the R2000 is no longer available in the UK. What printer would you recommend for the best quality? Is it possible to do black t-shirts and white t-shirts with a single setup? Unfortunately, we have not tested this eBook with SC-P600 yet. It’s possible that it may be compatible since most A3 printers are the same but I’m not 100% sure about that. It’s possible to print on black / white t-shirts using a printer with 6 or 8 ink channels. At this moment Epson R2400 would be the most advanced model that I know is compatible with the eBook and can print black/white t-shirt in high quality. But all other printers can also print in excellent quality! Sorry I have Epson L380 All-in-One Ink Tank Printer will it compatible to DTG and also with your steps. Unfortunately, Epson L380 is not compatible with this eBook. If you’re planning on using a DIY DTG for printing on t-shirt or for commercial purposes I highly recommend that you use an A3 printer. Hi I have Epson L1300 A3 Ink Tank Printer will it supports for conversion to DTG and also is it compatible with your steps. Yes, Epson L1300 is fully compatible with the eBook but you can only print on white t-shirt because this printer doesn’t have 6 or 8 ink channels but only has 5. Hi. I want to buy Epson L1800 . Do you have plan step by step for this printer ?? 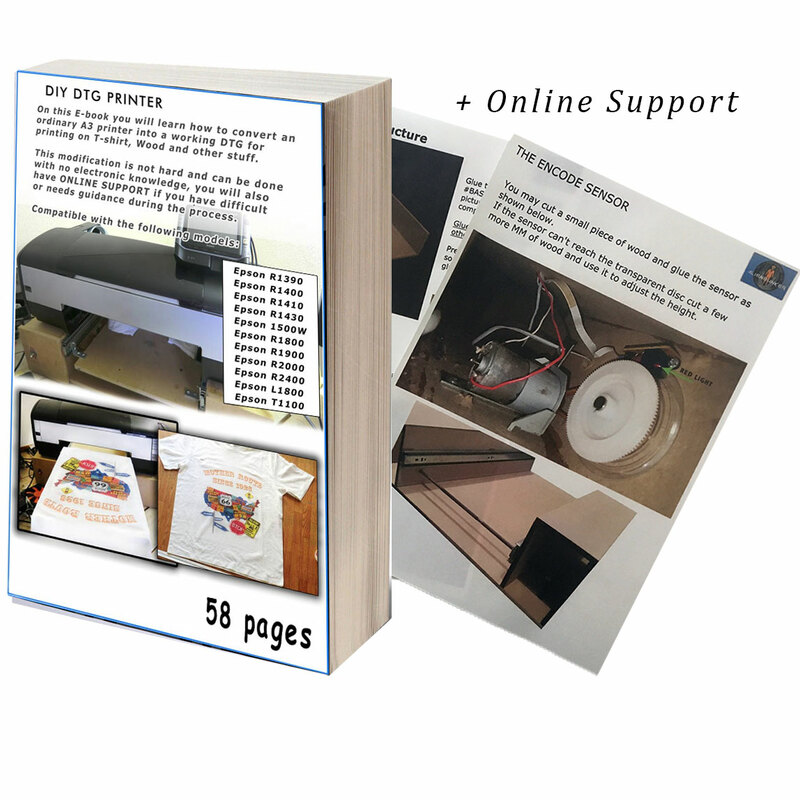 Epson L1800 can be converted into a DTG and it’s fully compatible with this eBook. That means the same eBook can be used for Epson L1800. You can use an used 1400 for testing purposes and learn how it works but in the end I think you will need to purchase another printer if you want to print in high quality. Also does this 1400 you saw gets a solid green light after powering up ? It does show a solid green light. Does your tutorial cover this model? and is it simply a lower quality printer than the 1430? Yes Epson 1400 is fully compatible with the eBook. The major difference between 1430 and 1400 is that 1430 has Wi-Fi capability but the rest is the same and the quality is also the same. Hello, this manual cover complete how to build DTG with Epson 1500 W ? There any risks when we move the sensors ? i’m IT technical, hope got skills to build this on Epson 1500 W, it’s really in detail ? This eBook supports 1500w and there’re no risks when converting but you need to be careful to not damage the sensors or cables when disassembling. You get online support when you purchase this eBook so if you have any question or need assistance feel free to message us. I found a 1400 for 15 bucks at a thrift store. It powers on and the printing head moves. I figure at that price, even if it doesn’t end up working, it will be good practice and testing for a new one later. Solid green light means it has no errors and if you get 2 blinking red lights it means a sensor or motor is malfunctioning. I have a Epson L310. Does this guide cover this printer? I don’t have commercial purposes. I just need A4 moels. Unfortunately the eBook is not compatible because it’s an A4 printer and the base dimension, sensors and mainboard is different so there’s no way to use this plan for your model. Sorry about that. Of course you can use this plans to learn how a DTG works and make your own plans for your printer. I have a Epson Artisan 1430 does this guide line cover this printer? Yes! The Epson 1430 is fully compatible with our eBook and it’s the most frequent used printer for conversion. If you have any other question feel free to message us. Hi. Any plans for a DTS guide not just DTG or how hard it will be to add motorized table bed. Dunno for a product up to 10cm thickness. In your guide, can I level a bed up or down, what is maximal thickness? I see most China made DTS machine are based on 4880 Epson model. 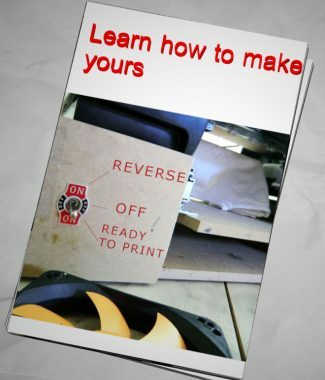 Do you think that I can use your guide to transform A2 printer? Thanks. It’s possible to use the current A3 DTG printers to print on materials with thickness up to 13cm. 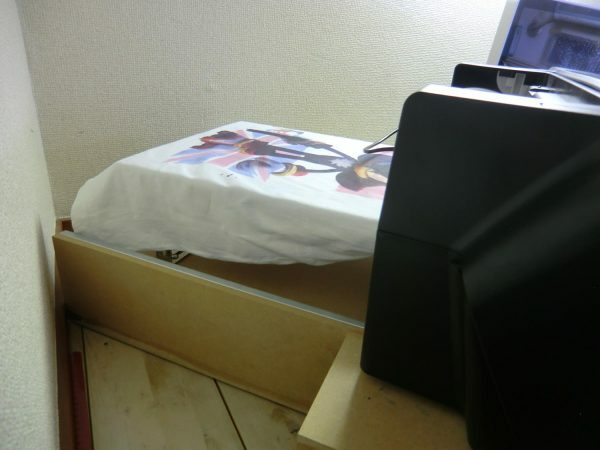 The bed level can be adjusted if you use a Laboratory Scissor Jack. Unfortunately it’s not possible to convert A2 printers because the table would have to bed huge and pretty heavy, I doubt the DC motor would be able to handle it. The only way would be using a motorized table with stepper motor but that would require a lot of modification and extra hardware parts. I’ve just bought and download the plans. They are very well explained and seems anyone can manage building it. I have just one question: in my country, the only printers I can get are the 1410 and the R2000. Which one would you reccomend? I’m hopping using it with commercial pourpose. Thanks a Lot! If it’s for commercial purpose then I recommend Epson R2000. It’s the same building process as the other models. Do you have details DTG building plans with Video for T60 & R230 Epson Printer?. I have few printers with me and I wish to convert them to avoid buying new one. Are you also giving RIP software? Unfortunately we do not have any plans for T60 or R230. The reason is because both of those printers are A4 models and the quality output is not as good as A3 printers. Although they’re not hard to convert since it has less sensors to deal with but if you’re planning on doing it for commercial purposes I don’t recommend it. Costumer support is really good and fast. Im just wondering this part, in your new version on page cover & description it says, assuming that you already disassemble epson etc.. does it mean that you just referring to outer cover or inside the parts/ components? I’m planning to buy this, but got little stuck with this thought. can you please clarify? I’m referring to the outer case and some interior parts but with the newer version available now it covers most parts now. It covers 80% of the process and the e-book covers the remaining parts. Hello! Sorry for my mistakes. I have little troble with my english. I wont ask you. Have you instructon to russian version for Epson 1410? Unfortunately no. You may have seen a video on YouTube in our channel of C88+ DTG but I never made any plans for it. The reason is mostly because it’s very unreliable and performance is very poor comparing to A3 models. If you need a DIY DTG you need an A3 model, it’s faster and has a great performance comparing with A4. If you have any trouble or question feel free to contact support for guidance! I bought the ebook and it’s very interesting I love it! Their online support is top! I bought the e-book when it was released and comparing to the new updates now it’s much better, KEEP IT UP GUYS! Excellent customer support and very responsive! I never thought I could build my own DTG. ok, I made the DTG according to the ebook and had a few problems, but it was my mistake and after I contacted the staff they helped me find the error and it’s now fixed. Printed 12 shirts so far and no problems yet. I just bought it and arrived by e-mail instantly. It’s not hard when you just have to do what the guide tells you. manual is big and well explained, what else can I say ?